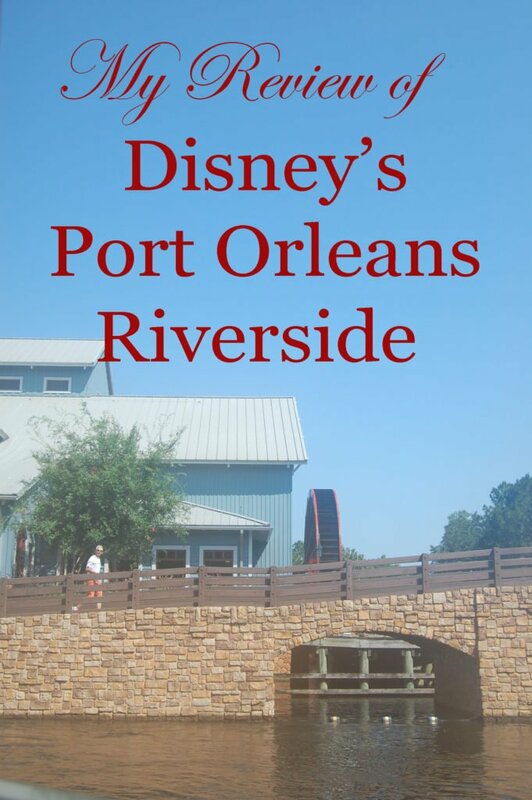 Port Orleans Riverside (or Riverside for short) is a moderate resort at Disney World. 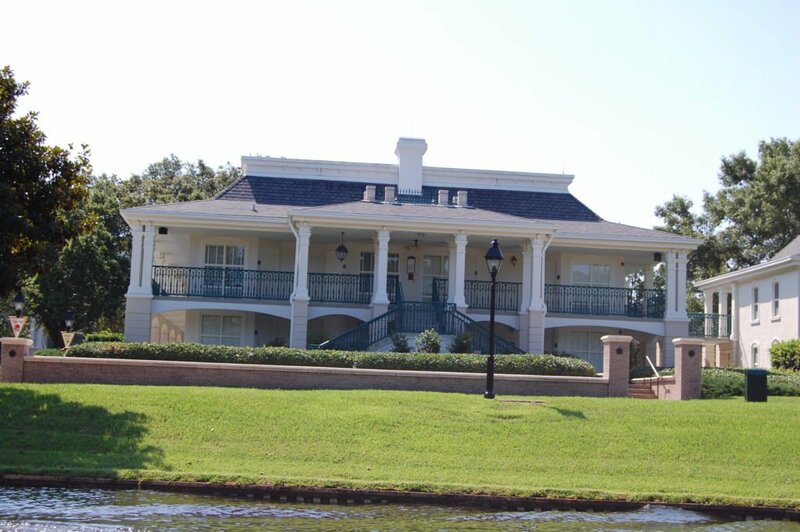 It is a sister resort to Port Orleans French Quarter, which I reviewed here. It is one of 22 Disney-owned hotels on property. We stayed here a couple of years ago and enjoyed our stay. This is my review of Port Orleans Riverside. 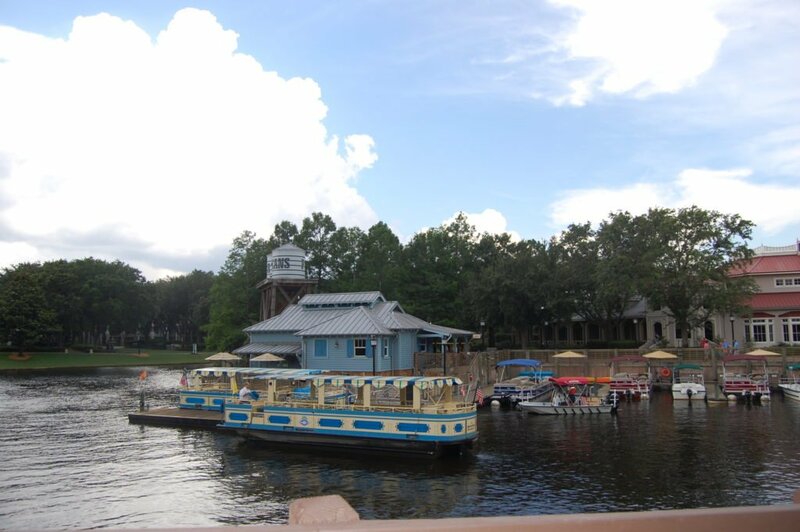 Riverside is conveniently located in the Disney Springs area of Disney World. It sits on the banks of the Sassagoula River. Downriver, you will find Port Orleans French Quarter (French Quarter for short), with Disney Springs beyond that. This is a beautiful location. While this resort is further from the parks than some of the other hotels, it is not a big deal. It never seems to take long to get to any of the parks from here. As I said above, Riverside is a sister resort to French Quarter. While they are sisters and sit right next door to each other, don’t confuse them. They are very different resorts. However, because of their relationship, if you are staying at one of the resorts, you are able to use all of the amenities at both. There is a walkway along the riverbank that goes between the two resorts. It will take you about 10 minutes to walk from one to the other. They are the only two Disney owned hotels that share amenities with another resort. This can be very advantageous to you as a resort guest. Riverside has 2,048 rooms. This is about twice the size of French Quarter. It is pretty close to the same size as all the other moderate resorts at Disney World. The resort is divided into two sections: Magnolia Bend and Alligator Bayou. The resort is quite spread out, with rooms being divided up between 20 different buildings within the two sections. That means that depending on where your room is, you may have a bit of a walk to get to the main building or pool from your room. Now, because the resort is so big and spread out, there are 4 different bus stops here. They are spread around the edges of the resort. So, while you may be a ways from the front of the resort, you can still be close to a bus stop. This sprawling size is definitely one of the biggest negatives to this resort. However, the same can be said for all of the moderates, except for French Quarter. The trade off is that you get beautiful resort grounds that are generally quiet. Riverside’s theme is derived from the Mississippi River area of the Old South. Magnolia Bend is designed to look like the stately old plantations. This section of the resort is divided in to 4 large three-story mansion style buildings. 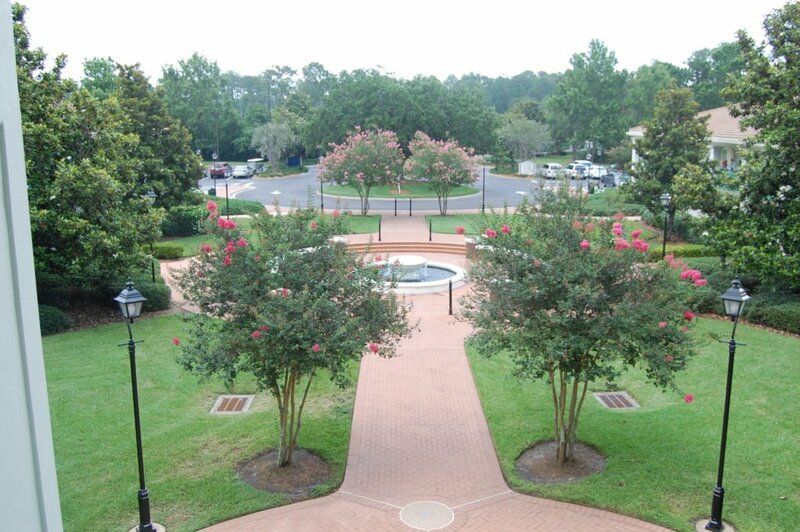 In this area, you will see well-manicured lawns, formal gardens, and sculptured fountains. The feel in this part of the resort is one of elegance and sophistication. You almost expect to see a Southern belle in her best ball gown come strolling down the pathway at any moment. Two of the buildings in Magnolia Bend house the Royal Rooms. These rooms, which will cost you more than most of the rooms here, are themed after the Disney princesses. The backstory to the Royal Rooms is that Tiana hosted all of the other princesses to stay here while visiting her. The princesses each left something behind to remind Tiana of their visit. Any little princess would love to stay in these special rooms, which are themed above and beyond your normal Disney resort room. Alligator Bayou, on the other hand, is designed to look like the more modest homes found in the bayous of Louisiana. These two-story buildings are smaller with a darker paint scheme. They have a more rustic, cottage feel to them. The grounds in this area is less formal and more natural, with tall pine trees. The buildings are tucked into the surroundings instead of being the focus of the grounds like the mansions of Magnolia Bend. Two other differences between the two sections: Alligator Bayou buildings do not have elevators but they do have Murphy beds, which means you can sleep 5 people per room. We stayed in one of the Magnolia Bend rooms when we stayed here. Our room was very convenient to the pool and main building. We were very pleased with the room and its location. You can use Disney transportation to get from Riverside to anywhere else in Disney World. To get to Disney Springs, you can take either a bus or a boat. The boat also makes a stop at French Quarter before continuing on to Disney Springs. To get to all of the parks, you must take a bus from this resort. During slower times of the day, Riverside will share buses with French Quarter. However, during the busier times, such as at the end of the night, the two resorts will each have their own dedicated buses. When the resorts share buses, they will stop at French Quarter first and then go on to Riverside. The buses will stop at all four of the internal bus stops at the resort, regardless of whether they also stop at French Quarter. Like I said above, it doesn’t seem to take too long to get to any of the parks from here on the Disney buses. 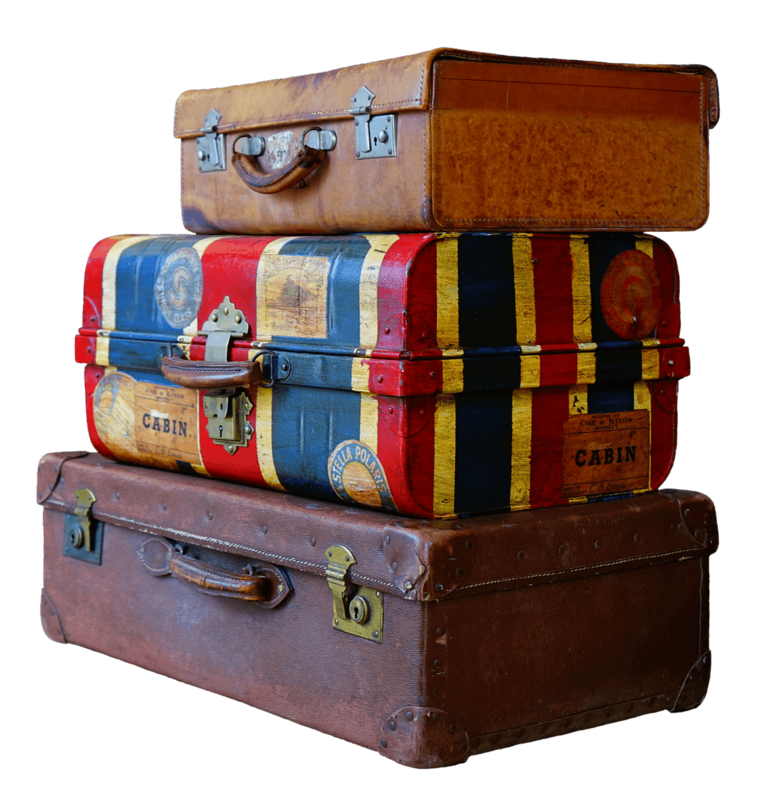 I will give you two tips on using the transportation system when staying at Riverside. First, if going to Disney Springs, take the boat instead of the bus. It is faster. The second tip is one we learned when staying here. Because Riverside is so much larger than French Quarter, when leaving the parks at night, the lines at the Riverside bus stop are always longer than those of French Quarter. Therefore, even if you are staying at Riverside, get in the French Quarter line. You can get off at French Quarter and then walk along the river to get back to your room. Not only will this get you on a bus faster, but it will also allow you to have a nice, quiet stroll back to your room to end your night. This became one of our favorite parts of the day once we figured this out. The prices at Riverside are in the middle range when comparing all of the Disney hotels. The prices here are about the same as you will find at French Quarter next door. Rack rates will range from about $175-300, depending on the type of room you select. Prices will be higher during holiday times. While the prices at the two sister resorts are about the same, usually discounts at Riverside will be bigger than at French Quarter. This is mainly due to the fact that the smaller French Quarter fills up faster. During our trip a couple of years ago, we originally booked our stay at French Quarter. However, I changed our reservation over to Riverside because there was a bigger discount. It saved me a few hundred dollars, as opposed to thirty or forty dollars to stay at French Quarter. Riverside has one table service restaurant and one food court. Both are located inside the Sassagoula Steamboat Company, which is the name of the main building. It also houses the gift shop, lounge, arcade, and check-in desk. The table service restaurant is called Boatwright’s Dining Hall. It is themed after a boat-building company. The food court is called Riverside Mill. In the seating area of Riverside Mill, you can see the inner workings of the building’s working water wheel. We have never eaten at Boatwright’s. However, when we stayed here, we ate at the Riverside Mill every day. My favorite part of the food court is the make-your-own pasta bar. It was delicious! Also, you can take advantage of the food court at French Quarter if you stay here too. The main benefits of the French Quarter food court are that they serve beignets, and it is not as busy as Riverside Mill, due to the size of the two resorts. You will find a whole list of recreation options at Riverside. There are many more recreation options here than at French Quarter. There is an island in the middle of the Sassagoula River in the center of the resort. The island is accessible by several bridges. You will find the pool, the pool bar, the playground, and the fishing hole on the island, which is named Ol’ Man Island. 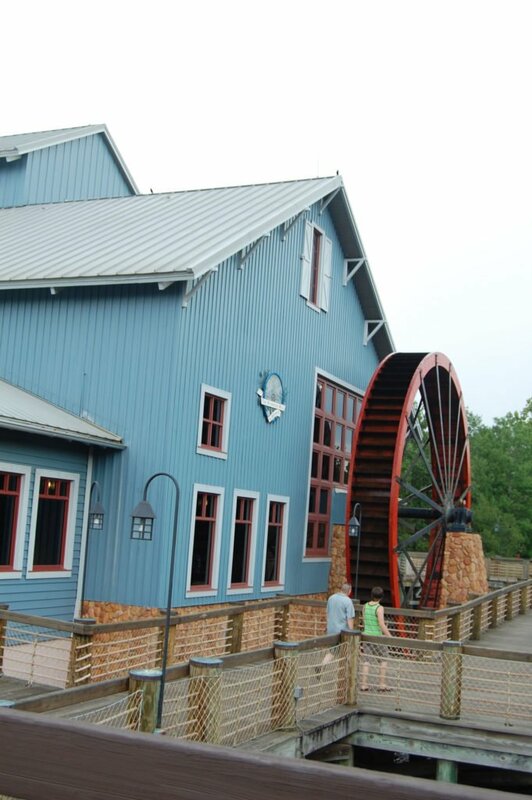 At the boat dock, you can rent bicycles and surry bikes to ride around the resort and along the river. You can also take horse-drawn carriage rides for an additional charge. The pool is quite large and includes a small lazy river type setup. It also has a small slide. There are also several fun fountains and sprayers at the pool too. We have never taken advantage of the bike rentals or carriage rides here at Riverside. However, we have gone fishing at the fishing hole twice. There is a dedicated fishing dock on Ol’ Man Island. You can rent cane poles for about $12 for 30 minutes. They will also give you worms to use as bait. It is catch and release fishing only. We have not had much luck with catching fish, though. 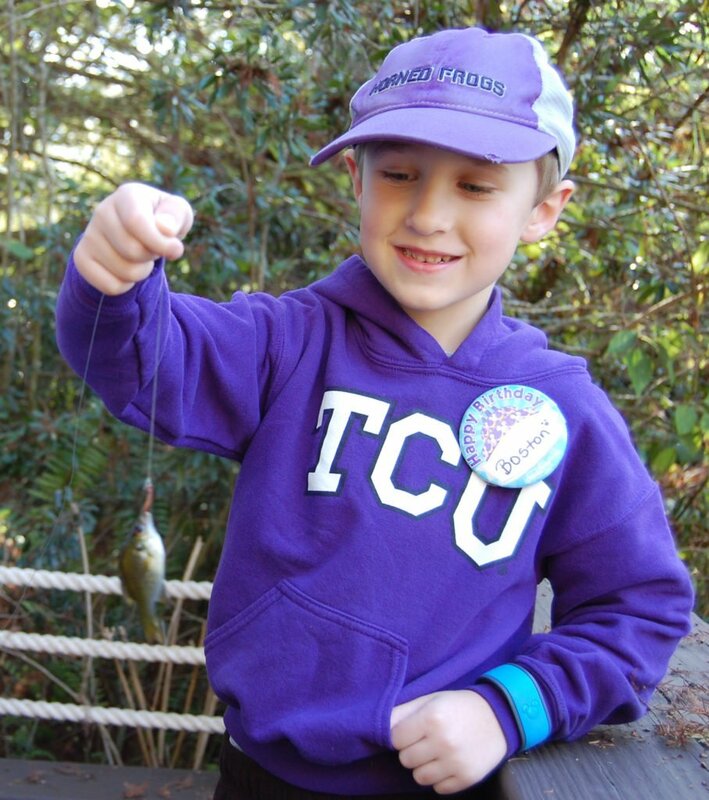 On each of our two times fishing, we only caught one tiny fish. It was a fun diversion, though, especially if you have kids that have never done anything like that before. It makes you feel like you are hanging out with Tom Sawyer and Huck Finn! 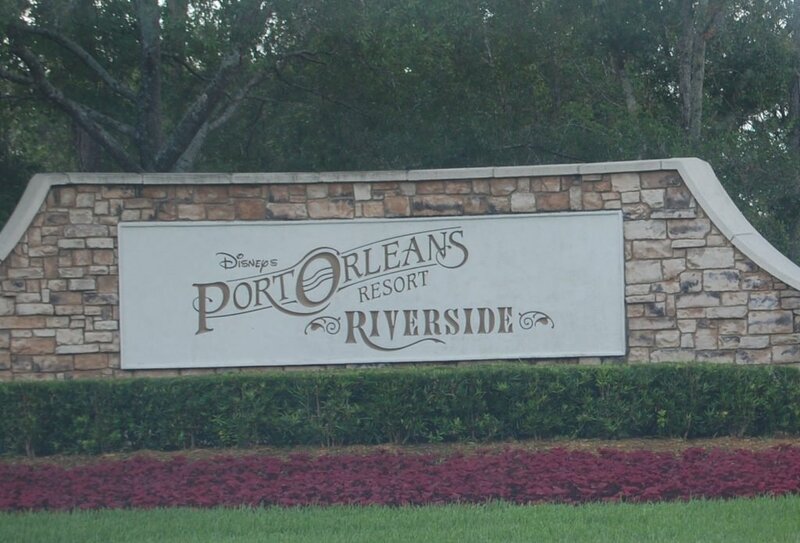 Riverside is a large, moderately priced resort close to Disney Springs. It is themed around the Mississippi River area of the Old South. It has two different sections: Magnolia Bend which is designed to look like the old plantations, and Alligator Bayou, which is created to resemble the humble cottages of the Louisiana bayous. 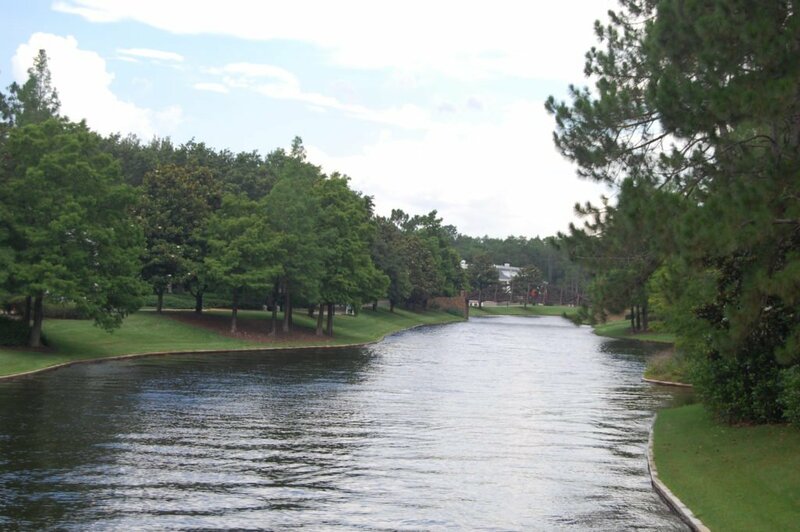 The Sassagoula River runs right through the middle of the resort. This is one of the most beautiful resorts that you will find. It is quiet, peaceful, and relaxing. Its sister resort, French Quarter, is located just down river from Riverside. There is a table service restaurant at the resort, along with a laundry list of recreation options. While we tend to favor French Quarter over Riverside, this is mainly due to the difference in the size of the two resorts. However, this is a wonderful resort, and we loved our stay here. I hope this review of Port Orleans Riverside has been helpful to you. Happy travels and have a magical day!